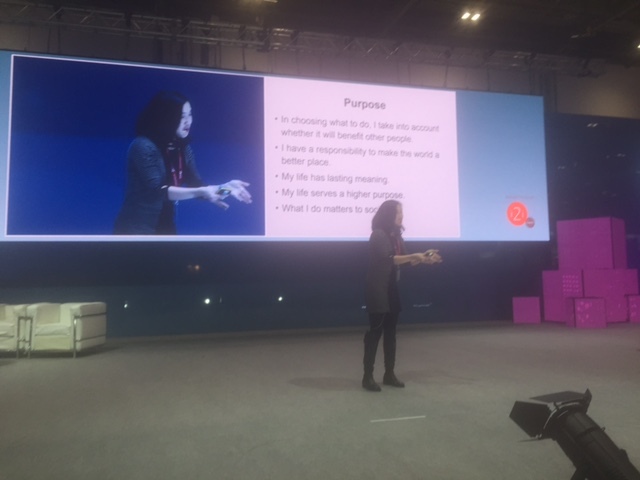 It takes grit—a powerful, sustained passion—for learners young and old to ultimately succeed in school and work, Angela Duckworth, a psychology professor who studies top achievers, told an audience of educators and ed-tech providers here at BETT, the world’s largest ed-tech tradeshow. “They would talk about a kind of stamina, a stick-to-it-iveness,” she said. And they conveyed a deepening commitment to the same area of achievement. “To have grit is to stay interested in things—and to get more interested in the same thing,” she said. Duckworth’s research is starting to inform development of digital tools designed to increase perseverance, while tracking students’ mindsets and emotions. Her work has drawn international attention as she won a MacArthur “genius” grant in 2013, and last year the Walton Family Foundation announced that Duckworth would receive a grant to research how to measure grit and persistence in classroom settings. World-class experts in fields like chess, mathematics, ballet, and radiology show sustained commitment to their fields of excellence. “Only the world-class experts are able to stay on the learning curve, typically thousands and thousands of hours,” she said. To get off that plateau requires a repetition called “deliberate practice,” she said. But the old adage “practice, practice, practice” is only half the story for gaining expertise and high achievement, she said. To achieve “deliberate practice,” students must set a specific goal, concentrate 100 percent, get immediate and informative feedback, then reflect on the feedback, refine their practice, and repeat it, starting over from the beginning. Duckworth said she rarely sees immediate and informative feedback occurring in education. Olympic athletes, she pointed out, typically do deliberate practice three to five hours a day, with an almost superhuman stretch goal in mind. And winners of the National Spelling Bee in the United States who were asked to keep a diary about what they did to prepare for the competition reported that the practice was “not very enjoyable and very effortful,” Duckworth said. What will help them win the high-pressure spelling bee is not work that they will intrinsically enjoy because it’s fun and easy. “It’s deliberate practice that determines how you do,” she said. Learning about the science of deliberate practice can be powerful, Duckworth said. “Low-performing students who learned about the science of deliberate practice … increase report card grades over the next marking period without any other intervention,” she said. Grit is also about doing something that you care about, Duckworth said. World class performers are typically very skilled in one activity, not multiple ones. The key to getting students to demonstrate grit is not to tell them that it will be good for them if they demonstrate it, “but to show it will enable them to contribute more to the people they care about,” Duckworth said. “Teenagers are among the most receptive to this message—that grit is highly associated with purpose,” she said. Focusing on talent is not always the way to develop grit and realize achievement. Sometimes, Duckworth said, she sees no correlation between talent and grit. “Many students—when they drop out, when they stop trying, when they’ve given up on themselves, when we’ve given up on them—whatever talent they have” is lost, Duckworth said. “Sometimes the more talented you are, the less gritty you are,” Duckworth said. In her interviews with high-performing coaches and business leaders, the researcher discovered that—when learning comes very easily to talented students—they miss out on gaining some of the skills needed to succeed. “You don’t have the practice of screwing up. Those kids never have an opportunity to fail,” she said. For the older learners in the audience, there was good news: Duckworth displayed a graph showing that grit improves with age. Correction: Duckworth received the MacArthur Fellows Program grant in 2013. The year was incorrect in the original blog post.